Scott Chatfield and myself started Exowax Recordings in 1999. For the first album we would release on the label, Scott encouraged me to run with any flight of fancy I might like to undertake, perhaps a dream project of some kind. It didn’t take me long to reach a decision. I was about 12 years old when I first had the idea for Nonkertompf and I had fantasized about doing it ever since. It would be the perfect dream project to kick off a new label. (The label name “Exowax” also stemmed from a childhood event, in this case a Ouija session with my cousin Lucille, which also happened when I was 12 or so. I asked what record label I would record for when I grew up, and was informed that it would be called Exowax. I asked who would run the label; the answer was “Lamn Xavb.” To this day, “Lamn” is a personage invoked by Scott or myself when budgetary decisions must be made – we frequently ask ourselves if a proposed expenditure will meet with Lamn’s approval, and it actually does help us decide. I’m not troubled by this contact with supernatural forces; I don’t have any reason to believe that they were in any way aligned with dark energies or demons. Clearly they were simply interested in music). Of course, I didn’t have the music for Nonkertompf worked out when I was a kid. A little additional background: when I was 11, I started designing a long series of album covers (front, back and gatefolds) for an imaginary band I and some of my school pals were in, called Wrangthorn And The Armadillo (after a few albums the name was shortened to Wrangthorn). I did around 40 full cover designs (including one for a ten-album boxed set), and also did the cover for my solo album, which was called Nonkertompf. It was meant to be a significant departure from my work with Wrangthorn; it would be an instrumental album, with all the music playing uninterrupted, me playing all instruments, with a black and white cover with half my head on it. Fast forward to 1999 and the beginning of Exowax, and all I had to do to make the dream come true was conceive and record the actual music, and that turned out to be nothing but fun: unashamed, total self-indulgence from start to finish. As I’d done for Sluggo!, before beginning tracking at Double Time, I recorded a bunch of grand piano tracks at Signature Sound with Mike Harris engineering. But whereas with Sluggo! I had a bunch of songs already written, for Nonkertompf I went a bit more off-the-cuff: I had a few structures written, some musical motifs that I would form into structures later, and some concepts for improvisation. I went into Signature and recorded a couple of hours’ worth of stuff. All of these piano recordings were then taken to Chatfield Manor and chopped into song forms in the computer, and I took those forms into Double Time to begin overdubbing onto them with Jeff Forrest. Jeff Forrest at Double Time Studios in El Cajon, who I had worked with on the first three studio albums, was the perfect engineer to do this project. He and I were always productive in the studio, but we’d be laughing our heads most of the time – he’s one of the funniest and generally most entertaining people I’ve ever worked with. We had a great time working with all the musicians involved in the first three records, but now it was just the two of us and we were in the sandbox for real, all gloves were off, the fish were in season, you name the metaphor. We had a ball during the whole process and pulled off as many weird ideas as we could. I was interested in trying to play instruments I’d never recorded with before, like the upright bass on “Nine” and “Oprah Talks To Teens,” the violin on “Piezo Clambake” and the small, plastic electronic saxophone (borrowed from Bob Tedde) I used for the soloing on “Blue Jean Baby” (instead of plugging it in, we mic’d it up, and the noise of my fingers hitting the sax keys is an audible component of the sound). Some of these efforts worked better than others – the upright bass playing sounded fine; the violin: eh, not so much. I was also excited to further my drumming career, which had started in earnest on Sluggo! 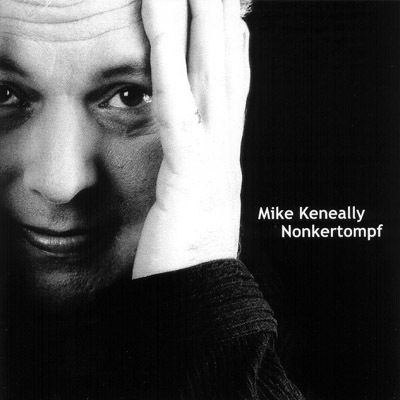 The drumming on Nonkertompf is highly enthusiastic. 97% of it doesn’t embarrass me. When Steve Vai heard the album for the first time, he said to me, kind of hesitantly, “Wow, the drumming is kind of…all over the place, isn’t it?” I said, “Yeah, well.” Later on Steve told me he’d listened to Nonkertompf again and realized that the damn-the-torpedos, hell-with-what-anyone-else-might-think feel of the drumming now felt intrinsic to the message of the album for him – that that was the way it was meant to be. I appreciated that! The more orchestral-sounding music on the album (things like the “Paprika” and “Rake Bannuh” pieces, as well as the piano solo “Oh Angel” and the dance track “O, Stamp Collector”) was derived from various soundtracks that I had recorded for the Court TV television network. Yes, this is the network that eventually gave us Nancy Grace but back in the late 90s it was altogether a different sort of proposition, one that gave an aspiring composer like myself a very useful venue – not unrelated to the fact that my friend Jonathan Greene (whom I had met on the first day of kindergarten and stayed in touch with ever since) was a producer for Court TV and kept giving me work. I went into Lyle Workman’s home studio in LA (this was years before Lyle became the go-to soundtrack composer for the Judd Apatow movie empire) and, using his sumptuous sound libraries, recorded hours of cues for four different programs, and Jonathan was kind enough to grant me permission to re-use the material however I saw fit. I’ve gotten a lot of mileage out of it as it turns out: in addition to Nonkertompf, various Court TV cues found places on Wine And Pickles, Scambot 1 and You Must Be This Tall, and there are still a bunch of good ones in the larder. A couple of pieces were birthed at Ed Lucas’ studio Hog Heaven (“Chew” and “Hum”) and further overdubbed at Double Time. “Hum” started as a very modest little recording that has, over the years, developed into a rather epic stage vehicle for my various bands. Initially it was just a bit of experimentation to try out recording with Ed at his space – he got beautiful tones in that studio (which I could have/should have done more to maintain in full fidelity once I started chopping and layering, but I was less concerned with audiophilia and more into building up odd constructions of sound (cf. Todd Rundgren’s A Wizard/A True Star or the early work of The Residents). Nowadays, I’m still into creating surreal soundworlds but am also a lot more diligent about keeping the audio quality high – one of the major benefits of having constant ready access to Chatfield Manor, and frequent access to Mike Harris. “Click” was an important piece on the album, situated early in the running at the conclusion of the brief sonic maelstrom (inspired by the beginning of A Wizard/A True Star) that ends the opening piece “What Are You Doing.” The main part of “Click” was written on acoustic guitar (sitting on the floor of Rich Pike’s bedroom in Steve Vai’s old place in the Hollywood Hills in 1998), the same day I wrote the lyrics to “Backwards Deb” (on the same floor), but the whole piano-based ending was improvised at Signature, edited for clarity and then overdubbed onto at Double Time. In 2001 I was invited by Co de Kloet to bring my 7-piece Beer For Dolphins over to Groningen, Netherlands, be supplemented by a further four Dutch musicians, and perform a live arrangement of Nonkertompf at the Marathon Festival held at De Oosterpoort. I worked hard on the arrangements, and we did the best we could with a rather limited amount of rehearsal considering the difficulty of the music, and ended up with a spirited but definitely flawed performance – as so often happens, it would have been wonderful to have a few gigs to work through all the issues. But it was a great time, and several of the arrangements became core pieces for my live performances for years afterward; in particular “Hum,” and the medley of “I Just Got Here,” “Naked Horse,” “Blue Jean Baby” and “The Knife And Drum” which for brevity’s sake has become known simply as “Nonkerchunk” (a really good version of which can be found on the Dog special edition DVD). Mike’s seventh album is a very personal instrumental effort featuring Our Boy playing everything, including guitars, keyboards, drums, sax, a stool and about a dozen other devices. Nonkertompf is a 74-minute stream-of-consciousness flight-of-fancy that takes the listener on an unparallelled sonic journey. Countless styles and moods are explored and seamlessly sewn together, always with extraordinary musical precision, rich orchestrational sense and a very big heart. It’s his first release on Exowax Recordings– in its first few weeks of release it became San Diego’s best-selling CD and made the national charts. Check out Nonkeroni! to read what others think of this disc. A very limited edition of 500 copies of Nonkertompf came packaged with Nonkertalk, a lengthy interview with Scott Chatfield and myself talking at length about the making of the album. The CD is long out of print, but the audio is available for download at the Keneally Store; if I remember correctly (haven’t heard it in a long time) it is highly informative. In addition to the extensive yakking it also has a bunch of different mixes of album material used as soundbeds for the interview, plus several outtakes which I actually like a lot but couldn’t fit comfortably into the running order, including the oddly named “Making Love To Jewel” which has one of the coolest guitar tones I’ve ever recorded (the old Hamer Duo-Tone emanating acoustic and highly effected electric sounds simultaneously). This is the rare second CD originally included in 1999’s long-sold out two-CD Nonkertompf Special Edition of 500. By popular demand (and the gracious permission of MK fans who originally bought the Special Edition), downloadable digital copies of the original Nonkertalk pressing are now available for purchase. 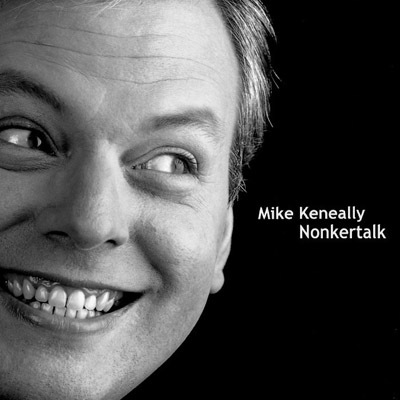 Nonkertalk features a 40-minute conversation between Mike and Exowax CEO Scott Chatfield about the making of Nonkertompf. Beneath the voices are different mixes and alternate takes that illustrate and underscore what is being discussed. Occasionally, the interview stops completely for an interlude of music not included on Nonkertompf. Nonkertalk is topped off by a short QuickTime video, “ClickFlick,” playable on most computers. It shows Mike in the studio recording the song “Click” (some owners of the original CD are, to this day, unaware of the video’s existence! ).